Stuck with the task of organizing a raffle? Don't worry. You're not alone. Hundreds of raffle organizers revealed their toughest challenges and the solutions to overcoming them in our 2009 Annual Raffle Survey. From their responses, we've identified the top three pain points along with tips and resources to turn your next raffle into a winning ticket. Unfortunately, a raffle that's not backed by sponsors will do little in the way of fundraising. Developing a dedicated group of sponsors is the most important aspect of a successful raffle. Sponsors make raffles profitable by donating prizes. Prizes drive ticket sales and ultimately generate revenue for your cause. Raffle organizers agree; having the right number of sponsors is more important than simply having a large number of sponsors. 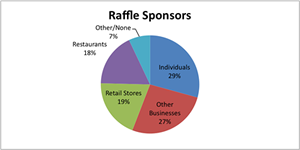 As you can see, most raffles have one or two sponsors while only 14% have more than six. When allocating your time to find sponsors, remember that quality counts. Deciding which sponsors are the best fit for your organization will vary depending on the purpose of the raffle. However, consider investigating "other businesses" such as law firms, real estate companies, banks, or even grocery stores who are not traditionally associated with raffles. Remember to search within your organization for individuals with specific skill sets, such as massage therapists or tennis instructors, who are willing to donate their time and services as a prize. 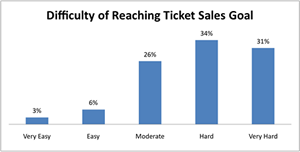 42% of raffle organizers agree that acquiring raffle tickets is an easy barrier to hurdle when hosting a raffle. However, it's worth taking a look at the options available to best fit for your organization. Design and print your own: Do-it-yourself ticket design software is available online at software download sites such as 5 Star Files. This is the budget option, which may be appropriate for organizations hosting multiple raffles without a need for high quality tickets. Buy them online: Online ticket printing services are an affordable choice for organizations that need a high quality product. We stand behind our quality and service at TicketPrinting.com with a 100% satisfaction guarantee. Talk to a local designer and printing company: This option varies greatly in both price and quality, but may be a good choice for organizations with contacts in the industry. Finding volunteers to sell tickets and realizing overall sales objectives caused the most pain for raffle organizers. Prizes - Small prizes with monetary values between $1 and $20 are great ways to involve those who want to contribute but are not willing to break the bank for your cause. Consider having two raffles, one with small items and inexpensive tickets, and one with large prizes and expensive tickets. Large items will yield the greatest return and often make it easier to sell tickets as word-of-mouth for your event spreads. Volunteers - Provide sales incentives for your raffle ticket sellers. 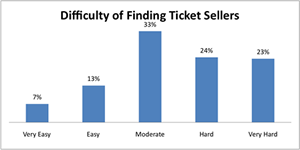 Organizers reported two basic approaches to motivating volunteers to sell tickets 1. Make sellers financially responsible for selling a minimum number of tickets or 2. Give prizes to your top selling volunteers. Host - Make your raffle an event to remember! 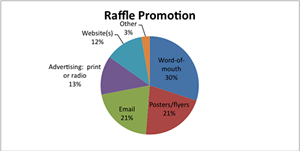 65% of those surveyed held their raffle in conjunction with another event such as a dinner or party. Create an atmosphere that is fun and encourages people to be a part of your important fundraising event. Promote - Not sure how to get your raffle noticed? Not surprisingly, word-of-mouth is the most important promotional channel. To create word of mouth buzz, make your raffle fun by mixing in humorous prizes. Also, script out and practice a memorable sales pitch with ticket sellers. Depending on your specific situation, consider Posters, Flyers, email, advertising, or posting information on your website. So take a deep breath, relax, and remember: you can make your raffle a success. These principles help thousands of organizations raise big money through raffles every year, and now, you can too!